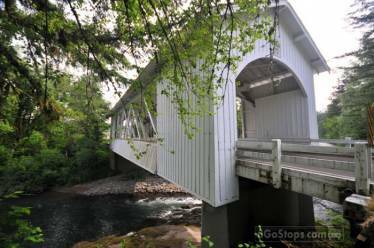 The Hannah Covered Bridge is the youngest of 5 covered bridge spans on the Thomas Creek in Linn County, Oregon. 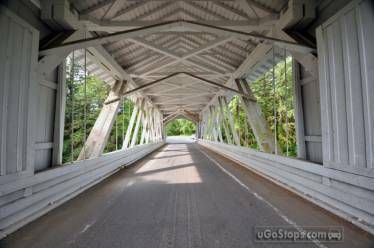 It was built in 1936 and spans a length of 105 feet. Thomas Creek, which the Hannah Covered Bridge crosses, was named after Frederick Thomas, who arrived to the area in 1846, received a donation land claim and settled on the banks of the creek. John Joseph Hannah, for whom the Hannah Covered Bridge is named, arrived by wagon train in 1853. He built one of the first sawmills in the Linn County area after receiving a 151 acre land grant. 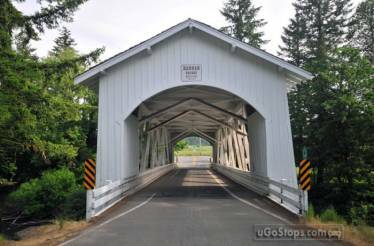 The Hannah Covered Bridge design has exposed beams, segmental portal arches and white board-and-batten cladding. It emits large amounts of light due to the openings on both sides. The National Covered Bridge Restoration Program provided a grant of $696,000 for the Hannah Bridge and the project is expected to be completed for $460,000. Portland Bolt specializes in manufacturing nonstandard construction fasteners for covered bridges. For this project, we were asked to manufacture over 1,000 carriage bolts and hex head lag screws which had to meet the Buy America Act requirement. Because Portland Bolt manufactures all products at our 94,000 square foot facility, this project was right up our alley. The contractor had strict scheduling requirements which were easily met with our quick lead times. The product had to be hot-dip galvanized as well. Our in-house galvanizing line is perfect for threaded fasteners and our customers never have to worry about nuts fitting onto our bolts. Do you have a project that requires 100% melted and manufactured in the USA fasteners? Give Portland Bolt a call. We will make it easy to get the products you need in the timeframe you need it!